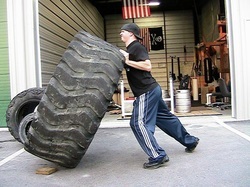 Matt Wichlinski Super Beast From: "... Matt is one of the strongest Gents I have seen. His conditioning and skill with a barbell complex is like nothing around. This guy personifies the word "BEAST" and "FREAK" if you are looking to get in the best shape while getting insane gains in strength then you should check Matt out. I highly recommend him." "If you're anything like me, you accept nothing less that TOP QUALITY! When choosing the type of coach you need to take your fitness and sports performance to the next level, you need to hire a TOP QUALITY motivator and results maker.... you need take a good look at Matt Wichlinski." "Matt is one of the BEST Coaches I have ever come across. He has a keen eye for knowing how to build ANYONE into a brutally strong, explosive, highly conditioned ANIMAL. Matt's ability to Coach AND walk the talk impresses me beyond words. I trust Matt 100% and would send my son to train under his guidance. If you have the chance to train with Matt, DO IT!" "The Homemade Bulgarian Training Bag video, was my first introduction to Matt Wichlinski. I was blown away by it and that same day went out and made my own. I have since become a huge fan and student of his videos. I am constantly pushed to my limits by them. I just had the pleasure of meeting Matt at the HTKA Seminar hosted by Zach Even-Esh and Paul Reddick. Matt is even more impressive in person. Matt Wichlinski is a strength training guru. You NEED to train with him, he will make you DOMINATE your competition." "Matt from the Strength Shop changed my life. That’s a bold statement for a strength and conditioning coach, but it’s true. Not only am I stronger and more fit, I am also much more confident and assertive in my daily life. After I broke my arm doing about 2000 box jumps (the wrong way) I decided I had to change the way I worked out. These marathon sessions were taking a toll on my body, in time, energy, and injuries. That’s when I met Matt. He took this former long distance endurance runner and turned her into to a heavy weight-lifting (and getting heavier everyday) fool. And I’ve never felt better or been happier. Family and friends have noticed a change not only in my body but my attitude as well. Matt’s tough no-nonsense style belies a passion for training, an unwavering patience with this weight-lifting novice, and a regular fitness encyclopedia. he is not for the faint of heart but he will get you results. But you better like to work because he will work you hard. I wholeheartedly recommend Matt to anyone who is serious about their fitness and their health or would just like take their training to the next level." My constant hunger for knowledge and new types of training led me straight to Matt and The Strength Shop's training video's and articles. After a few months of reading, watching and corresponding with Matt via his forum and email I decided I needed to meet and learn from him. My time spent training at The Strength Shop was not only extremely informative but motivating as well. The active warm up Matt put me through was by far the most in depth and performance enhancing warm up I had ever participated in. Since then I have abandoned the warm up's I would use with clients and switched to his method and with no avail my clients feel more prepared and their level of performance has sky rocketed! The next thing that impressed me about Matt was how great of a teacher he was. Not only did he work with me on my own form using kettlebells and Olympic power lifting movements, he taught me drills and progressions for each exercise to improve not only my own performance but my clients as well. Lastly, the thing that impresses me the most about Matt how much he cares about his clients and his profession. 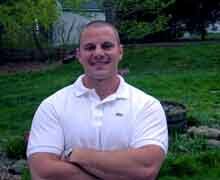 Matt seriously follows what he preaches and is a true trainers trainer. Anyone out there that wants to train hard or improve their own training business I highly recommend working with Matt Wichlinski! Working with him there is nowhere to go but up! "What can I say about Matt Wichlinski's methods... they are the most creative and challenging exercises I ever done, I have tried a lot of strength programs but the same always happen, with the past of the time, I start to become bored. Matt combines a lot of power, strength, and speed, but most important he challenge´s you to the limit. If you live in Virginia don't waste your time doing some gym s%&t that doesn't work, go with the BEST strength coach in VA. Trust me he is the future!" "Que puedo decir de los metodos de entreno de Matt Wichlinski? son los metodos de entreno mas creativos y desafiantes que he hecho, yo he intentado con diferentes metodos de fuerza y siempre me sucedia lo mismo al paso del tiempo me aburria, Matt combina mucho poder, fuerza, velocidad, resistencia, habilidad, gimansia y lo mas importante te desafia al limite, si vives en VA no desperdicies tu tiempo en membresias de gimnasios de mi#$%& no funciona, ve con el mejor entrenador de fuerza en VA, Matt Wichlinski el es el futuro." Francisco Tobias dueño de la academia de artes marciales Tobias Bros. Guatemala, CA.